If you are reading this, you are invited to come out on March 7th to the Ice House Gallery and help me celebrate surviving the recession and my first anniversary in business at the Ice House Gallery. We will be serving Italy's own version of champagne "Prosecco", from 2:00 until 5:00 along with some wonderful chocolates and strawberries. These are the only foods that real artists should eat.......no one needs brussels sprouts! I opened Ice House Gallery on Valentines Day last year, but the awful blizzards forced me to reschedule my celebration to March 7th. This year has taught me to follow your dreams as long as you have breath to do so. The gallery is located at 291-B Main Street, Washington Virginia 22747, and normal hours are Friday, Saturday, Sunday and Monday 10 am til 5 pm in the winter and until 6 pm in the spring, summer and fall. I am so excited this week. 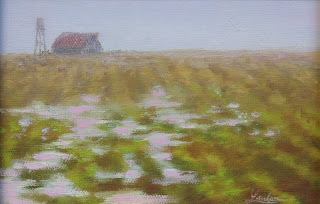 On March 2, I will start a Plein Air Painting class with master artist, Sara Linda Poly. I have long admired her work and was fortunate enough to sublet her studio a few times when she was going to be away for an extended period of time. It was this experience which led me to leasing my own studio away from my house. I found that having a dedicated space away from home, greatly improved my productivity and focus. Also, I got to view her works up close and found great inspiration there. A friend asked me why I would take a landscape class when I paint landscapes so well. Simple answer: No artist should ever stop taking classes. There is always something else to learn. I have long wished to improve my landscapes, so I am taking a class from someone who's work I greatly admire. Just a reminder to followers of this journal, I am not a painting a day painter. It is not my intention to "crank out" art at the cost of quality. Yes, I manage to pick up a paint brush or do something art related each day of my life, but I don't just whip out something so I can say I am a painting a day painter. That said, I do try to do a small study when I think I have a good idea for a larger work. Sometimes I will see the idea was not so good and this way I eliminate a lot of wasted effort on bad subjects or compositions. This little 5 x 7 is just such a study. I think this shows promise and before long I intend to do a larger version of this study. It is with great sadness that I inform you of the passing of my dear friend, Tucker Hill. I met Tucker in 2000 when I became a member of the Middle Street Gallery. Tucker was our label maker for the shows for all the years I was also a member. He never complained about the folks who could not seem to get their information to him in a timely manner, but he did throw a funny little reminder their way to "light a fire" under them, including myself. 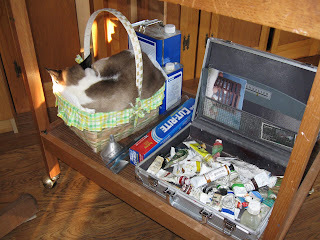 Tucker once told me that "Getting artists to work together is like wrangling cats". Tucker was an exceptional artist, a printmaker who did the most incredible monoprints I have ever seen. But, more important, he was the epitome of the Southern Gentleman. There was no one I have ever met, who was more courteous, gentle and refined in spirit and deed. I never heard him utter a mean word about anyone. All the times I saw him at receptions with wine glass in hand, I often thought the glass should have been a mint julep. Tucker was also one of the funniest men I have known. My husband is the funniest, but Tucker was definitely second when it came to a special brand of dry humour. I once jokingly complained to Tucker that his titles for his works were a bit like novels. His reply was, "Oh, I thought that was a short title and was thinking of adding more to them. I was trying to help you improve your reading skills a bit." And he did! I can honestly say that my life has been enriched for having known Tucker. He will be greatly missed. 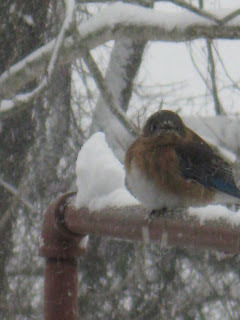 Can you believe I had this little bluebird at my feeder yesterday during our second blizzard? Does this mean Spring is near? I think he is probably wishing he had not come back so soon. He looks absolutely miserable. Guess what my next painting will be? I am such a sap and could not resist. This is Picasso, my studio cat. He likes to nestle in among my recycled paper towels. I fold and place towels that were only used to dry clean hands, into this basket on my taboret. I don't much care that he is there until I need a paper towel and they are covered with cathair. Oh Well, at least he does not critisize my work. Our second blizzard of the week started last night and is really cranking up now, so I need to get this posted before we loose our utilities again. No electric means no computer. No telephones means no communication at all. 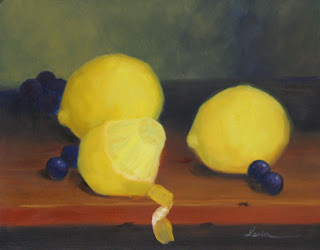 I placed the little lemon painting which I felt might be done, up on a shelf in the studio. I do this so that I can glance at my paintings as I pass by for a few days. I will usually either still love the painting or find something I have missed, after a few days. It only took me two hours to spot a real problem with the painting. I felt like the lemons looked cut out and pasted on. 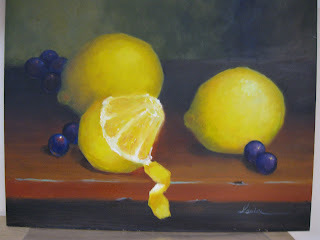 I realized that although I had soft edges everywhere, the back left lemon was too bright and the same values as the foreground lemons. So I took it down a value or two and subdued the colors and eliminated the highlight. I also punched up the color and raised the value of the two grapes on the right, although I did not give them a bright highlight. I think this has worked wonders for the painting. Snow and Art do not mix. 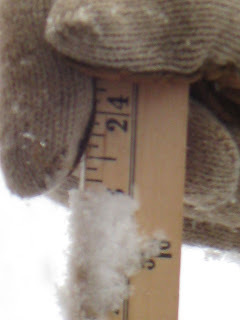 I have just spent the last three days digging out from the snowstorm of the century. We lost our electricity and telephone and let me tell you, it is near impossible to be enthusiastic about painting when your studio is at 50 degrees. So we sat huddled by our gas log fireplace in the livingroom and waited. Our only entertainment was a battery powered radio and lots of good reading material. Then at 5:30 it was too dark to do anything, so we slept. Let me explain about country living......no electric means no lights, no toilets, no running water, no hot showers, no heat and unless you have a gas stove there is no cooking. 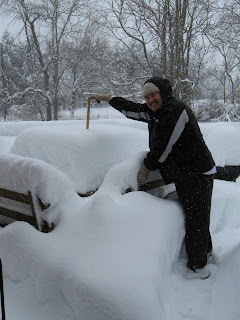 Although my husband is smiling for the camera, by Sunday afternoon, he was ready to pack it in and move to the city. We spent a lot of our two days off, shoveling out and our poor dog Molly, bottomed out in the snow and had no place to go potty. So we shoveled her an area to do her business in. Today I warm again and actually working on the lemons again. I discovered something I had missed and am reworking some areas. I will report on that tomorrow. I worked on the lemons this morning. I wanted to draw attention to the left side and foreground lemon, so I brightened the yellows and whites, put in some detail on the peel and front edge of the table. Still not happy with the travel of the eye in the painting, I decided to darken the table more at the back and I darkened the four grapes in the back and reduced the highlight spots to a middle value. The final touches were to brighten the color on the one foreground grape and put in a very bright highlight on that one grape. I used a tiny bit of Phthalo Green and added it to white to create just a tint of color for my highlights. I used this same tint for the highlights on the lemons. I used a crappy old brush and simply dabbed the paint on to create a dimpled peel effect. I will probably frame this in a gold plein air style frame and have it on hand for the February 14th celebration of my one year anniversary at the Ice House Gallery. I am thinking that I should commit these little lessons to a future instructional book or maybe set up some internet classes. I have looked into e-bay sales and paypal. I don't think that is the route for me though. Since I am already set up to accept charges, I think I will offer work on this site in the future and allow folks to purchase with Visa, Mastercharge, Discover and American Express. 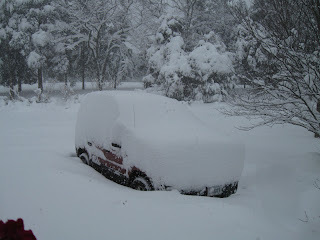 OK, I stayed home from work one more day "Because of the Snow". Actually, my body was not cooperating with me yesterday and the warm house was a better option. Here is the second short session on the lemons. At this point I have invested maybe three hours total in this little painting. Its on a 8" x 10" gesso board. The depth is well established now, the grapes are starting to shape up and I am quite happy with the table edge progress. BUT, do you ever do something even though you know very well it is not going to work? Yep, me too. I have known for years and years that Cadmium Yellow Pale Hue is semi opaque. And yet, I tried to cover the first layer as though I was using an opaque color. Very frustrating! And to further complicate things, this particular brand was very oily and I had previous marks of dark color streaks in the lemons from the first session. After fussing with it for way too long, I realized what I was trying to do and stopped. I picked up some Titanium White and added it to the yellow and that made it opaque. Unfortunately, I have now made my color chalky. So, I tell myself to not stress over this, just put a nice glaze of lemon yellow over the lemons near the end. This will punch up the color just before I lay in the highlights and reflected lights. Next time, start chalky and then glaze it. DUH!